We admire what Chip Peddler are attempting to do. Their community focus and company mission statement are admirable. We also love their company logo. However, this is a review of the bag. And as my Mom taught me, if you can't say anything nice, don't say anything at all. A whole Chip, and there were unfortunately not many, was a delight. A sizable amount were unfortunately not intact. The crunch was pretty good though. 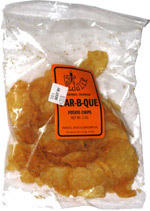 It is a standard Chip, but the thickness seemed to vary and a good solid Chip had an equally good solid crunch. Without the air filled bags we are used to these days, Chips are at the mercy of box packaging, shelf stacking and general handling. The bag we reviewed was full of broken and cracked Chips. The seasoning looked nice, but was plastered all over the bag along with grease that is ordinarily hidden from potential purchasers. The Chips did however look completely natural and organically grown, blemishes 'an all. It may have been a trick of the mind, but we spent as much time considering the organic nature of the growing and production process as we did the flavor. There was not much of a barbeque flavor, hints, but little heat. The combo with the rather high quantity of salt however, worked well with the fresh potato slices. An average but quite rewarding taste.